The Music curriculum at Twynham aims to inspire and develop our aspiring young musicians. Through teaching a varied and current curriculum, we hope to instil a love of music within all our students. What is it like to study Music at GCSE? You will have considerable preparation time for this task and 10 hours of controlled conditions when performances can be recorded for final submission to an examiner. You will have considerable preparation time for this task (under controlled conditions) for each piece when compositions will be written up for final submission to an examiner. 3. Examinations: Listening and Appraising: 40% of final marks. This course is for those who enjoy and are interested in Music. You will already have a clear idea of what Music is like. The subject is 60% coursework. You will be provided with opportunities to use both computers and the studio to create music and perform. You must be able to work well in this type of situation. If you already play an instrument or have instrumental lessons this will be an advantage, but it is not essential. There are ample opportunities for using Music Technology so if you have an interest in this area then this could be the course for you. 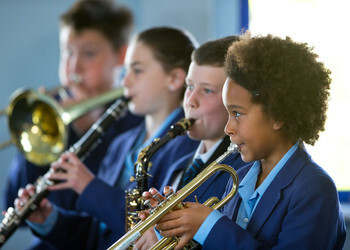 If you have enjoyed Music at Key Stage 3, then you should consider Music carefully. Apart from becoming a better musician, you will find future employers and higher education establishments value the many attributes music can bring to a student’s general development. Music is a subject that can truly benefit all your future aspirations. The AQA GCSE music programme offers an unrivalled opportunity for you to develop as a Musician and as confident young adult and provides an invaluable framework for knowledge that will benefit all of your learning. Good musicians are recognised to possess self-discipline, initiative, organisational skills, teamwork and many more important attributes. The GCSE music programme is precisely the vehicle to enhance your learning skills as well as providing the foundation for future academic and personal successes. GCSE Music gives you the exciting opportunity to become a more rounded musician and to discover some really inspiring music, in both challenging and familiar styles. - Western classical tradition since 1910. Whilst catering for all tastes, there are ample opportunities for you to develop and broaden your musical horizons. At the same time, it provides you with the musical grammar and syntax that might previously have been alien to you. Ultimately, you will finish your course with greater knowledge and skills as a musician. Music Technology is an important part of the course. Apple Macs and Logic are used for composition and you will learn how this software can best help when preparing coursework. Involvement in active music making on your instrument or within the studio is essential. You should be willing to work hard at your skills as a performer or producer and commit to peripatetic music lessons and extra-curricular activities where possible. Performing: As a traditional performer, you will learn to become better as both a soloist and as an ensemble musician. GCSE music allows development in all styles of music, and there are no restrictions or prejudice against any individual musical genres. Ultimately, you will become better at expressing yourself as a performing musician. There is also a Music Technology option where you will be able to act as a producer in recording other people's performances or perform a DJ set. Composition: As a composer, you will learn to utilise all your musical skills to express yourself in a methodical and organised manner. You will learn to use Macs to help you with this process. You will also get to experiment with new techniques and new sound worlds to broaden your musical horizons. Whether you are interested in producing dance tracks or writing Symphonic Variations, you will learn new skills to make your compositions original, and hopefully groundbreaking. 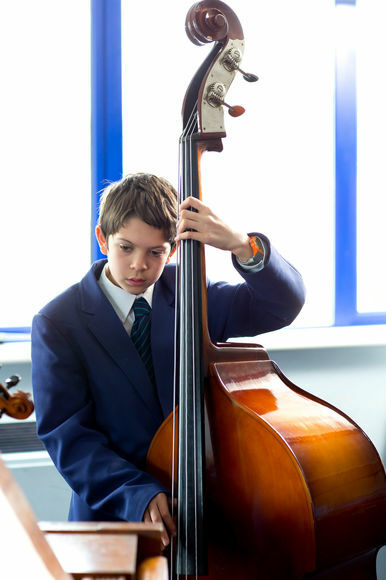 The three main areas of performing, listening and appraising, and composing are explored throughout our KS3 curriculum. We aim to develop students’ creative and evaluative skills that will equip them with the necessary tools for success across all curriculum subjects. In complementing the skills learned within the classroom, we also offer a wide variety of extra-curricular groups where students can choose to follow their chosen path and develop their skills even further. We begin the year by developing students’ vocals skills through exploring a wide variety of songs from different genres. Students then develop an understanding of the instruments of the orchestra, which will equip them with ideas for their Rondo form composition later in the year. Students’ compositional skills are also assessed through an understanding of Calypso music and this then leads them onto the last term of the academic year where students develop their performing skills through the topics of keyboard music and samba drumming. The beginning of year 8 builds upon the vocal skills previously acquired in year 7 where students study a cappella music. Students then delve deeper into their exploration of the orchestra where they will look at less familiar instruments and playing techniques. The Blues topic then allows students to develop their ensemble skills through a performance of a popular blues song. Through looking at music for film, students have the opportunity to access the iMacs to help develop their compositional skills. Students then further develop these skills through a song writing project which leads onto the final project of keyboard skills at the end of the academic year. Those students who have opted to study Music will begin the year by exploring Reggae music and its roots. This then leads onto a project on western classical music through the ages where students begin looking at some of the key works that are studied at GCSE. The topic of music and the media allows for the further development of compositional skills where classwork will be supported by the use of the iMacs. A project entitled ‘musical futures’ will enable students to improve their ensemble skills with the possibility of learning the basics of a new instrument. A brief look at musicals and their place within music history leads onto the final project of further developing keyboard and other instrumental skills.